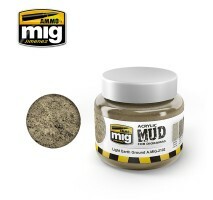 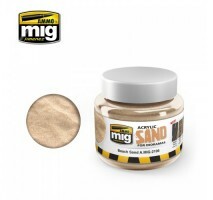 Acrylic ground material for diorama - new product!Ideal to represent arid, dry, desert ground250ml recipient..
Acrylic ground material for diorama - new product!Ideal to represent dry ground250 ml recipient..
Acrylic ground material for diorama - new product!Ideal to represent normal earth ground250ml recipient..
Acrylic ground material for diorama - new product!Ideal to represent turned earth, slightly dark earth250ml recipient..
Acrylic ground material for diorama - new product!Ideal to represent dark earth, dark mud250ml recipient..
Acrylic ground material for diorama - new product!Ideal to represent wet, muddy ground250ml recipient..
AMMO has created this new textured product with a unique and distinct formula which allows us to produce great finishes, almost lifelike in nature, for our dioramas and small scenes.The product is ready to use and has an acrylic base, which makes it ..
AMMO has created this new sand texture with a unique and distinct formula. It allows us to produce stunning finishes, almost lifelike in nature, for our dioramas, small scenes, and vignettes.. The product is ready to use and has an acrylic base, whic..